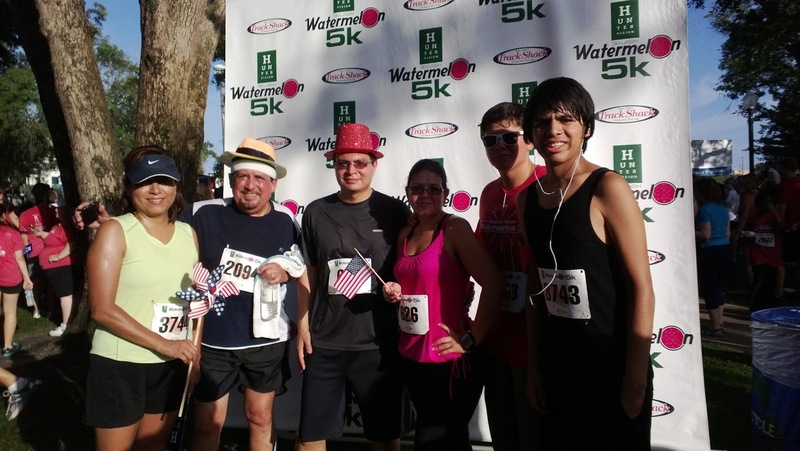 Faith, Coffee & Love : Watermelon 5K Race Report! 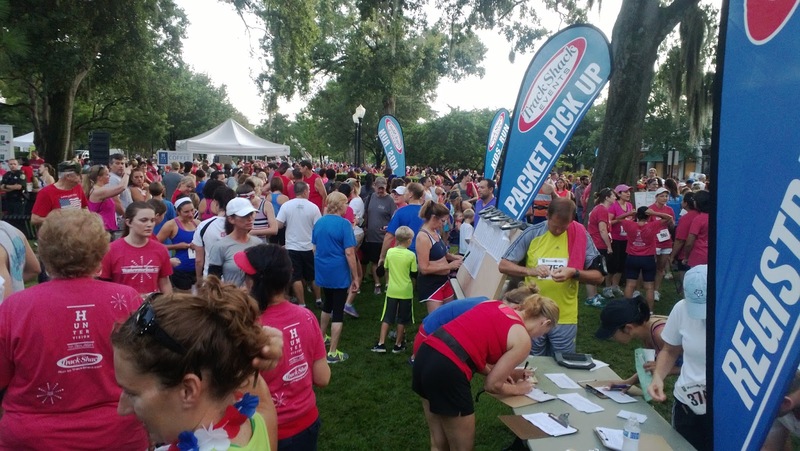 July 4th race day report!! How exciting my first ever run outside of Houston, TX! After looking and looking for a 5k to run in Florida we decided on the Hunter Vision Watermelon 5K, there were lots of 5k's to choose from in the Orlando area and I am super happy we settled on this one. There were six of us who ran the 5k and one of the runners was Lety, when we first brought up the idea that we should run this race she didn't feel like she could run the three miles yet but as the date got closer Lety trained more and more and decided to go for it! I was really happy about her determination to do it! 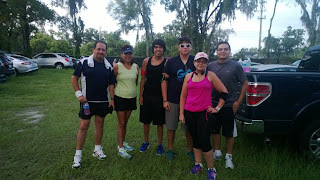 Actually in the first couple of days of being in Florida we all met the challenge of keeping up with our runs, being on the road all day or at the beach all day left us a little bit in super chillax mode, but Saturday night Lety set out on her run and came back after running her first 3 miles!! The race started at 7am and we were about 35minutes from where the race started and we in order to be there early to pickup our packets we all woke up at 5:15am and zombied about got ready grabbed our pre-race snack and headed out. Let me tell you after being in Florida for seven days using the GPS on my phone to track our our every destination point was getting a little crazy. Thankfully the night before I looked up the address to our race on my iPad and had a pretty good idea of where we were headed, in the morning I type in the address to my phone and realized it was sending in a completely different direction!! I started to think that we could end up missing the race altogether! I opened up my email and looked up my race confirmation, I click on the address on the email and it sent me to the location I had looked up the night before! I was so relived when we got close to the park and I saw the traffic of runners trying to get to the race :) we quickly got the hint that it wasn't going to be easy to find a parking spot so we parked a block or two away and headed over to pick up our packets. 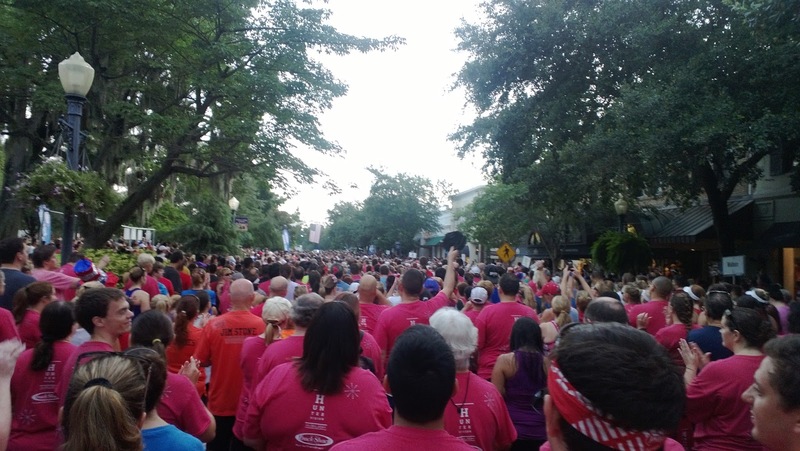 This race start location was at a park in Park Avenue, Winter Park Fl, which was really nice if I had to compare it to somewhere in Houston it probably would be a cross of Rice Village area and Heights area. All week long we were around touristy places this was a sobering change of scenery for us, it sorta made you feel like Orlando was normal after all. The rest of the race was great, I have only done four 5K's since I started so I don't have much to compare it too, but so far it's been the nicest trail yet! Parts of the trail were paved in brick and it was covered in trees and in Florida trees are normally covered in moss that drapes down...it was a beautiful running trail. There were people from the neighborhood cheering you on too and signs put up by Hunter Vision along the way one read "it's just as easy as putting one foot in front of the other" and one read "feeling blisters on your feet? 3D LASIK can't help you now!" They were cute and funny :) oh and they had the local college marching band playing near mile one and again close to mile three! It was encouraging and helped make the run feel like a true fun run. All in all the best part of the race was having everyone there with me, we had four first time official 5K runners with us!! 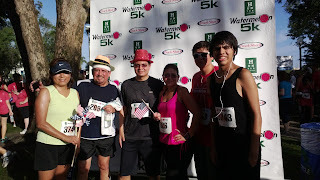 My hubby,my dad,Lety and my little bro all completed their first race - awesome!!! On the way back to our vacay "home" I looked over at Lety and asked her if she had liked it and she answered by nodding with a great big grin on her face! Woohoo!! As a side note I also found my self thinking things through out my vacation that I never thought I would be thinking! Like how in a 7 hour drive the thought "I should be running right now..." Kept crossing my mind or when we were driving the coast and I saw someone out for a run "I wish I could be running right now..." Or when I saw a long stretch of sidewalk along the coast "that would make a great running trail" or "hum I wonder how many miles that trail is..." Also missing my runs made me feel antsy, like we needed to hurry up and get back so I could squeeze my run in at some point. Just like right now, we are driving back home and I keep thinking "today is a running day for me and I'm missing it..."